The Mountain Edge Alpacas ranch contains one hundred seventy five acres carved out of the side of the mountain. This fall view shows the barn, house, and two pastures. 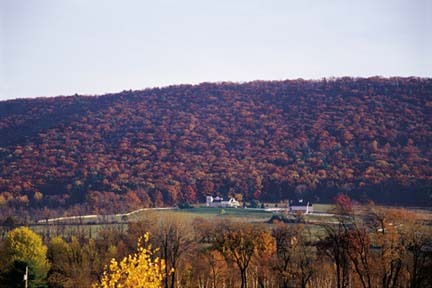 In the late 1980's, Ed and Charlene Friedman bought a 175-acre dairy farm near State College, Pennsylvania. For a number of years they tried to find a good use for all of their acreage. Finally, after reading an article on alpacas and visiting a farm, they were hooked. "After one visit to a breeder, we knew alpacas were perfect for us." Today, Ed and Charlene have one of the premier alpaca breeding facilities in the United States. After viewing this web site, we're sure that you too will agree that if you are considering the purchase of alpacas or are in need of breeding services, a visit to Mountain Edge is the right choice. alpacas, as seen across "Reflection Pond." 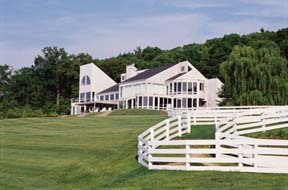 View of Charlene and Ed's home as seen from the barn. "We built the barn near the house, because alpacas are so much a part of our life. 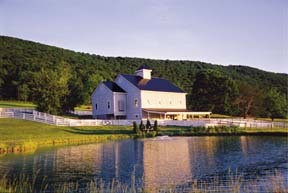 The West Barn - over 12,000 square feet. "We remodeled the old, original dairy barn last year so that we could expand our herd.
" 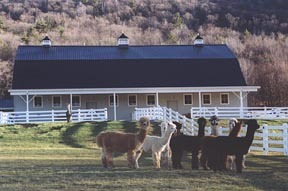 We chose to purchase our alpacas from Mountain Edge located in Central Pennsylvania even though we live in Colorado. The services and support Ed and Charlene gave us was far beyond what we expected and their copyrighted “Alpaca University” program got us started in the right direction and made us feel comfortable in our new venture. If you consider all the extras Ed and Charlene give (FOR FREE) and the quality and selection of their alpacas, Mountain Edge offers the best value anywhere. "